Home/Fishing/Spring fishing for trophy northern pike! When the ice starts to melt, big northern pike go on the prowl, not just for food, but for the ultimate spawning ground. As the sunlight attacks and the ice starts to trickle into the water, northern pike start moving into areas adjacent to the shallow sun-warmed spawning sites. Big female pike are hungry. They need energy for spawning, and they need big male pike to help them out, which means prime time for trophy northern pike! 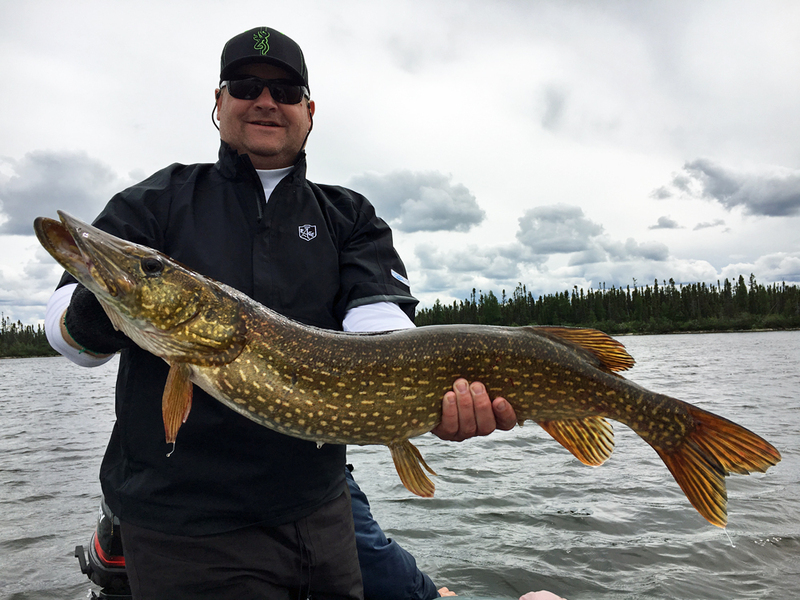 Jeff Gicewicz with North Knife Lake northern. As an added bonus, the pre-spawn period generally attracts fewer fishermen, which means more pike for those who don’t mind the sunny chill of spring. 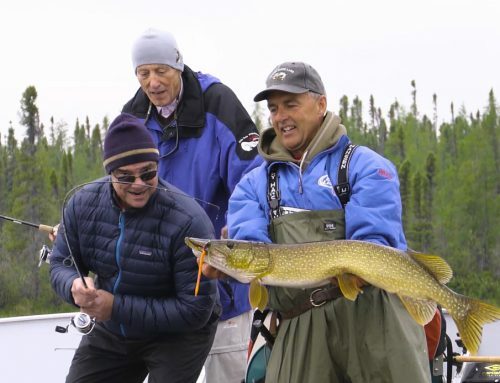 And since this is also the time of year when northern pike tend to congregate near the spawning grounds, you’ll spend less time finding fish and more time catching them. While the real monster northerns tend to stick to themselves, if you can find one or two small to medium sized pike adjacent to a spawning site, you’ll usually find more. 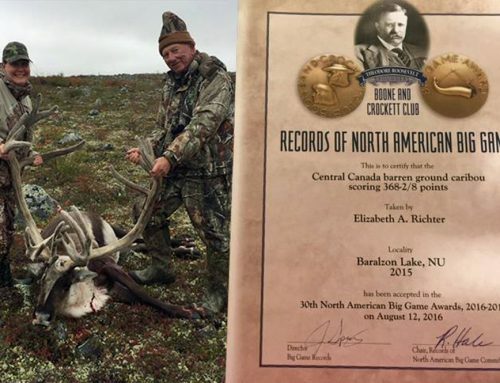 You can catch big northerns even before the ice is completely off the lake (if your local fishing season is open) by casting from shore and dropping your lure on the edge of the ice. Drag the lure to the edge of the ice and let it fall naturally. On a warm sunny day the flutter of a shiny spoon will be enough to entice a hungry northern if it’s in the vicinity. If that doesn’t work you can also try a quick jerk once the lure is a few inches down, followed by a light flutter and then a steady but slow retrieve. 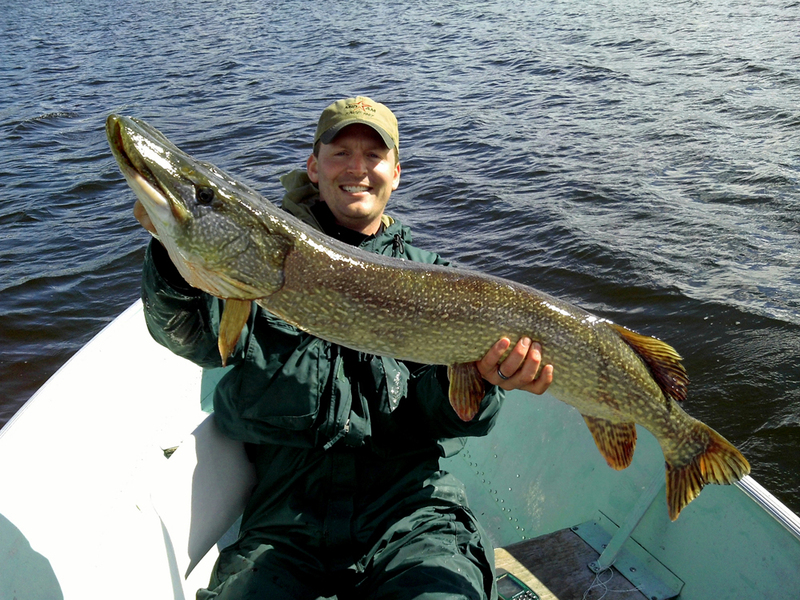 Jeff Knaebel with 47-inch Northern Pike caught on a fly-out trip to Small Lake. Click the image for Jeff’s story. Male pike will generally be more aggressive than females during the early pre-spawn period but all big pike will take dead-baits, slow moving spinners and crank baits. Pike move into warmer shallow bays and flats with slightly murky water as the ice fades. Darker water attracts both bait fish and sunlight, a double whammy for big pike hunters. Shallow, slightly murky, creek-fed backwaters with reeds, weeds and a sand-muck bottom are best, because they warm quicker than the clear hard-bottomed regions of the lake. 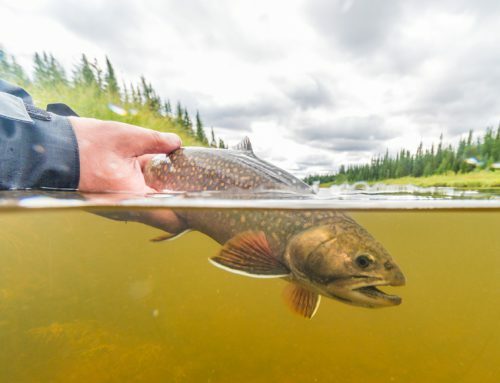 Trophy northern pike can be taken in less than three-feet of water on a warm spring day, so if you see a big log lying in the shallows, always take a second look. It could be that lunker pike you’ve been looking for your whole life. Five-inch minnow imitating plugs of silver, perch color or spots of red almost always work well for pre-spawn pike, just remember to keep the retrieve slow. Light plugs, floaters and those that will hold just under the surface work best, and if you’re going to cast spinners and spoons you’ll need to keep them light due to the shallow water. Fluorescent colors will likely work best in murky water but a flash of silver will also draw the attention of a shallow-water pike with one quick jerk of a spoon or spinner as soon as it hits the water. If you find the pike are following your stick baits or plugs up to the boat or shore but are failing to strike, try a three to five inch Mepps spinner with a bucktail and you might just change their minds. Outdoor writer (and a great cook too!) 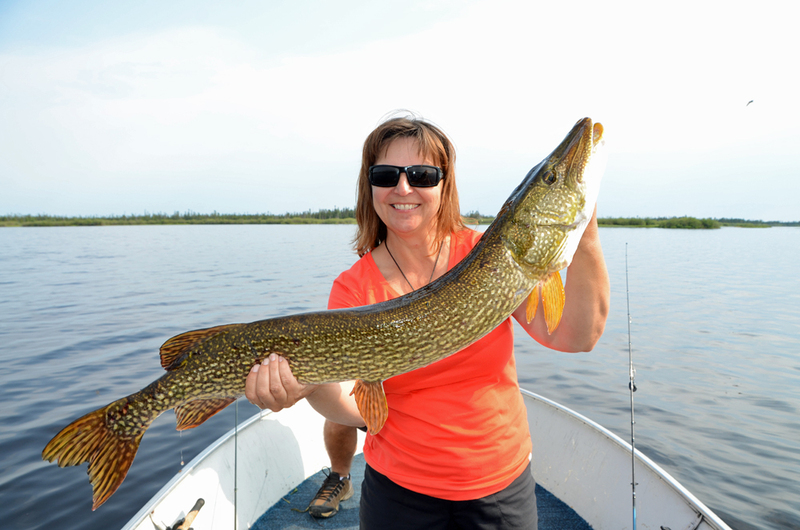 Shel Zolkewich with a spring pike at North Knife Lake. Click the image to read more about Shel’s trip. Sudden cold weather will push pre-spawn pike back into deeper water adjacent to the spawning areas, but they will move back into the shallows as the weather and water start to warm again. The pike will hold steady, often at mid depth in 10-15 feet of water during a cold front, and trial and error on your retrieve depth will help you find just the right level. Afternoon will usually be the best time for fishing in the pre-spawn period, after the sun has had time to sufficiently warm the water and the pike are on the move. The smaller fish will congregate in mid to shallow flats within a bay while the big monsters will hover off the points and move into the shallows to feed in late afternoon and early evening. In the pre-spawn and spawn periods, good spawning grounds combined with ample baitfish are the key to finding big pike. Later in the season, as the water begins to warm, pike will seek out cooler water and deeper weed beds, but these must still be adjacent to good baitfish hangouts. 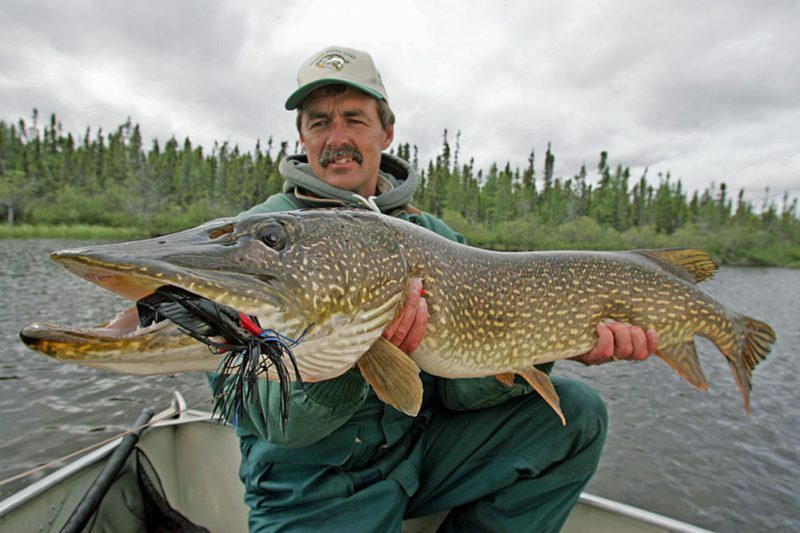 We catch numerous Master Angler northern pike every spring and summer at North Knife Lake Lodge. 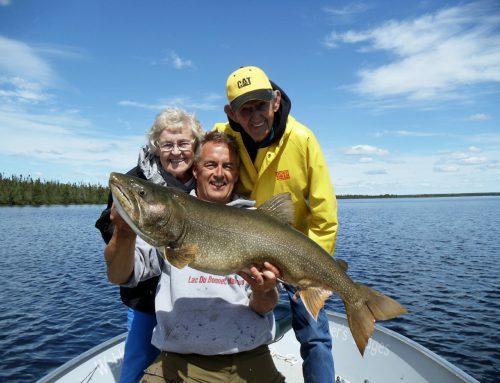 The cold pristine waters of North Knife Lake are strictly managed and fished by less than 100 people per year. 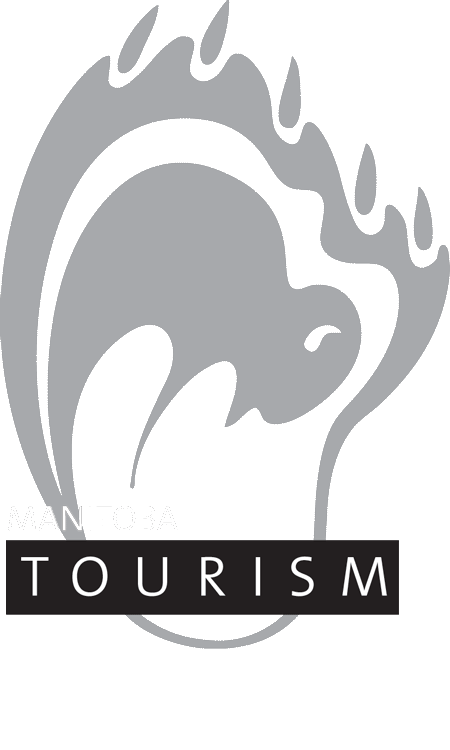 Thus it produces monster northerns (and lake trout) every season. And while it is catch and release, we do keep enough for the most delicious shore lunches on the planet. Big fish. Clean water. Exceptional food. Great company. We hope you’ll join us!